For example, the only limit in the Constitution is that presidents can't issue pardons for offenses relating to their impeachment. 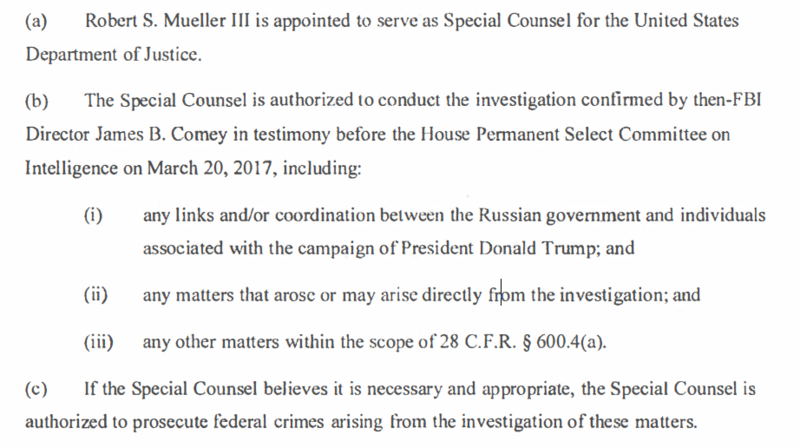 So was the cohen raid outside of the scope of the special counsel? Since it was simply a referral. Point being is that this is the A.G.'s in. He can now lay claim to this part of the investigation and begin to dig into the various aspects of the data collection and methods and since he is the boss over such he can now guide this part. Time to step up my a.g. sessions or get out now. Mueller was givin a certain scope of investigation and he turned up nothing after a year. He has indictments and guilty pleas. The investigation is ongoing. Now perhaps there are other crimes that may come to light but the special counsel is not the correct means to find the other crimes other than collusion. Read that very carefully, particularly (b)(ii-iii). He has nothing against trump after a year. yes there are existing agencies that can and should step in and investigate any crimes other than collusion. however since they are lumping everything under the sun into the collusion investigation they have tied the hands of the real top cops. that is how things are supposed to work. Just curious - how do you know he has "nothing against Trump after a year"? (and it has not been a year, he was appointed in Mid-may. Ken Starr took almost 2 years) How do you know what he has and what he doesn't? Just this last week, Mueller saw evidence of a crime that was outside the parameters of his investigation and referred it to the NYC office who then searched Cohen's office. Seems to me like Mueller - a Republican prosecutor with 40 years of experience knows how "things are supposed to work." Perhaps if you wanted it to go faster, Trump could have offered to speak to Mueller long ago. They started asking in December. Now Trump is refusing, because all totally innocent people refuse to speak to prosecutors, especially presidents. I cannot know for certain (and neither can you), but I suspect Mueller has a ton on Trump, from money laundering, bank fraud, FEC violations, and obstruction of justice. Yes, start pardoning people, and do it from the balcony of the White House in a military jacket, chomping on a cigar, and declare the 2020 elections null and void, as he is already the winner bc Muller has poisoned the campaign, and dissolve Congress and the SCOTUS while at it. May as well, if you are just going to pardon the criminals who helped you build the grease fire that is the White House. how do you know he has "nothing against Trump after a year"? now the raid of cohen since it was done by referral now sessions can get in there and take charge of that part. since referred that means not part of collusion investigation. No offence but either you are wrong or meuller is a liar in saying trump not a criminal target. Again, Mueller said Trump IS NOT A CRIMINAL TARGET. How much can that be spelled out? Are you one of them people who will keep repeating the same deluded thought in order to not have to accept reality? I bet you are. Judging by your past posts? Not impressed... in the slightest.